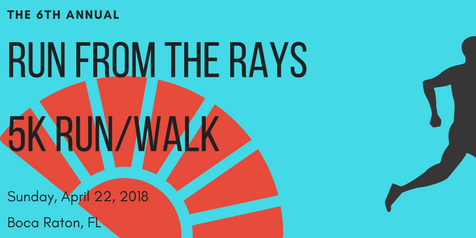 The 6th Annual Run From The Rays 5K Run/Walk will be held on Sunday, April 22, 2018. This Sunday, April 22, 2018, the Safe Sun Foundation will host its 6th Annual Run From The Rays 5K Run & 1 Mile Run/Walk events at the scenic Spanish River Athletic Complex in Boca Raton, FL. Safe Sun is a non-profit organization created to help in the fight against Melanoma and other forms of skin cancers by increasing public awareness & fundraising for the cause. Join hundreds of your fellow Boca Raton residents as they come together to run and walk to help raise money to support Safe Sun's mission of prevention, early detection, and treatment of Melanoma and related skin cancers. Race t-shirts and completion medals are guaranteed to the first 750 participants who have registered and paid the entry fee for the event. The 5K Run will begin at 7:00 am with the 1 Mile Run/Walk events beginning at 8:00 am. Following the races, stay and enjoy a healthy & delicious breakfast freshly prepared by Fit Foodz Cafe & take the opportunity to visit all of the generous event sponsors who will be present at the athletic complex. The event will feature a live DJ keeping the music & energy pumping all morning long, as well as a bounce house for kids & a free race for children 8 years of age and under. The Safe Sun Foundation will donate all proceeds from the event to select charities who share a common mission to provide screening, treatment, education, and research for Melanoma & other life-threatening forms of skin cancer. Some of the beneficiaries from previous years include The Caridad Center of Palm Beach County, Melanoma Research at Moffitt Cancer Center, and The Richard David Kann Melanoma Foundation, among several others. Please visit the Run From The Rays Sign-Up page to register for the event online in advance. Registration is open until 11:59 am on Saturday, April 21, 2018. The cost of registration for the 5K Run is $30, and just $20 for both the 17 and older & 16 and under One Mile Run/Walk events. Those who cannot physically make it to the event on race day but would still like to contribute to the cause, have the option to sign up for the “Virtual Run” which has a $30 registration fee. Please pick up your participant packet by 12 pm tomorrow, April 21, 2018, at Runner’s Edge, located at 3195 N Federal Hwy, Boca Raton, FL 3343. The Spanish River Athletic Complex is located at 1000 Spanish River Blvd, Boca Raton, FL 33431. If you have any additional questions or would like more information, please contact the Race Director, Fran Nicholas, at (561) 350-5110. Please come on out and join your fellow community members on Sunday, April 22, 2018, at the 6th Annual Run From The Rays 5K Run/Walk fundraising event in Boca Raton to help support this worthwhile cause. We look forward to seeing you there!… and don’t forget your sunscreen!